Stepper motor step angle is usually defined with parameters or a number of steps, the general motor revolution is divided into 200 steps, which is the step angle of 1.8 degrees, EasyDriver subdivision function with a step, this driver board subdivision 8 segments, that is, each step of the motor is subdivided into 8 small step, this can be more precise control, ie EasyDriver to 1600 steps to complete a full 360 degree rotation. rc1, rc2 h bridge fixed deadline for the analog input. a3967slb produced in the United States allegro pwm constant current control micro-step drive two-phase stepper motor dedicated drive. Its working voltage up to 30v, the drive current of 750ma, a a3967slb to drive a two-phase stepper motor can achieve 8 subdivision driver. Inside the chip pwm current control circuit can be added to the voltage set pfd slow, fast, mixed three current decay mode if the voltage is higher than pfd 0.6vdd, slow decay mode is selected. If less than 0.21vdd, then select the fast decay mode. In between the mixed decay modes. In addition, a3967slb also provide comprehensive protection measures, including inhibition of transient voltage, overheat protection against direct current, under voltage self-locking function. 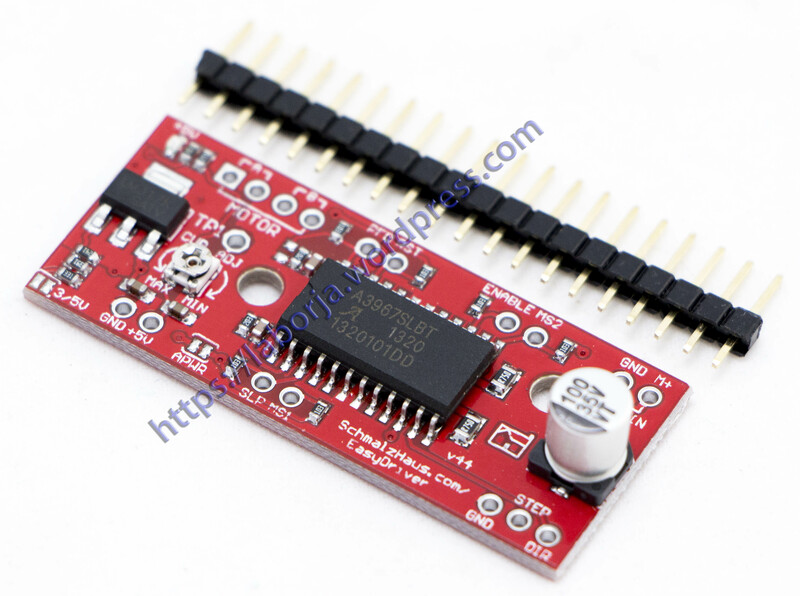 Interface, eight control lines decreased 2 (step and direction), simply enter the stepper motor control pulse, its embedded converter can be achieved on the stepper motor control.